Imagine holding a party in a big top tent erected on the side of Melbourne’s Yarra River. Inside, there’s a skateboard ramp big enough for three cars to drive up side by side and the live music comes from one of the biggest bands of the time. There seems no end to the free booze and the party’s head count is set at about 100. And, best of all, someone else was paying. 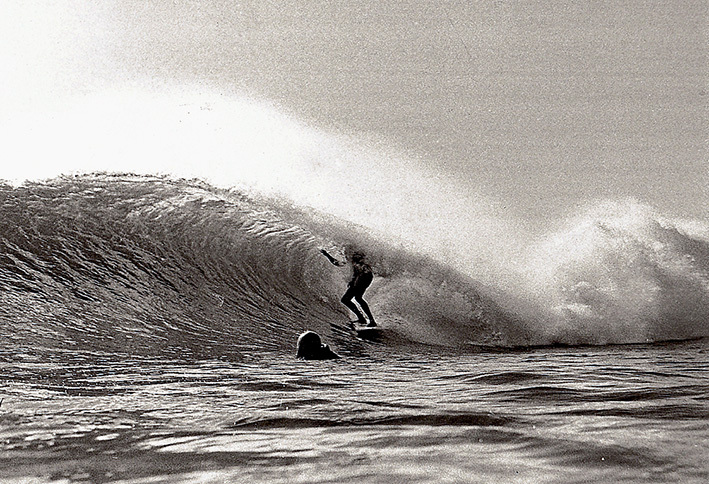 Seems a bit unreal, but that was the lot of the Breakway boys in November 1975. The three owners of Victorian-based surfing magazine Breakway had been approached by an entrepreneur wanting to cash in on the emerging surfing lifestyle scene. 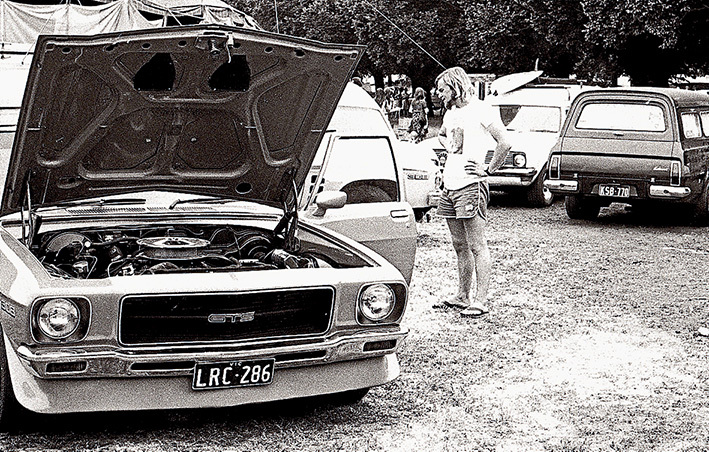 Knowing that the surfing idyll wasn’t just restricted to those living near the coast, the entrepreneur saw central Melbourne as the logical place to hold a surf expo – something like the car or home shows that annually attracted thousands to the Exhibition Buildings. 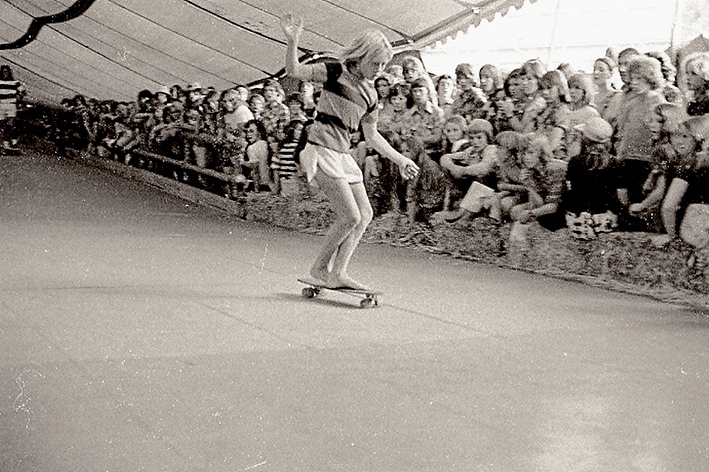 So Surfworld ’75 was duly held: exhibitors’ stalls, bands and the skateboard ramp inside the big top and “skurfing” – surfboards towed behind speed boats, the forerunner to wake boarding – on the Yarra. The event opening was a clever meeting of worlds, music and surfing, with Skyhooks lead singer Graeme “Shirley” Strachan and former world champion surfer Midgett Farrelly ceremonially cutting an occy (elastic) strap for the TV and press. Strachan, who along with his band mates had adopted the mid-1970s onstage glam rock (dress-up and make-up) image, was also a surfer. 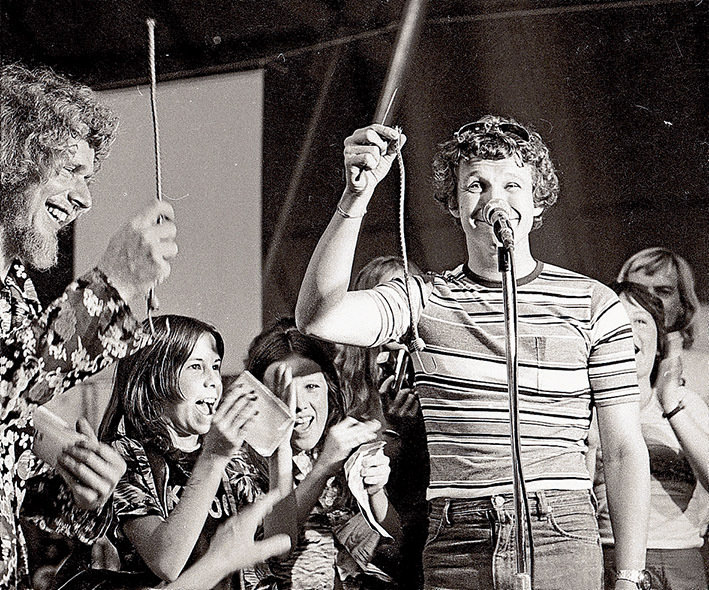 Once a regular at Phillip Island – where his mates had nicknamed him Shirley because of his long, curly blond locks – his spontaneous performances at the San Remo pub and in the waves of Woolamai were getting fewer in proportion to the increasing popularity of Skyhooks. The band was fiercely proud of its Melbourne roots, and one of the first to not shy away from referring to the city’s suburbs in its lyrics. Shadowfax, which also played at Surfworld, included Rip Curl employee, Gary Crothall, who is still working for the Curl and still playing in bands. Security was by young members of the Peninsula Surfriders Club. The hurly burly of working the crowds was no surprise for club member Chris Fowler as his father John was one of the organisers of the Sunbury Pop Festival. The three-day Surfworld ambled along and was probably a bit ahead of its time to be a raging financial success. 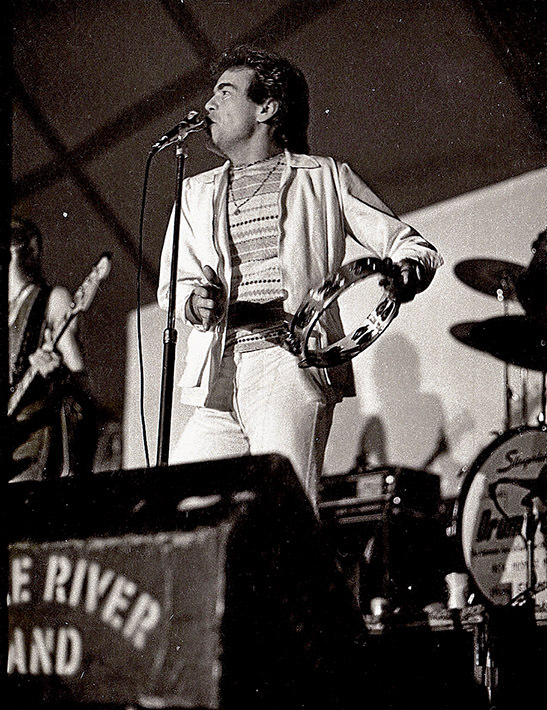 But the after party, with the lucky 100 being entertained by the Little River Band (hired for about $200 in a deal struck before their fame (and booking fees) skyrocketed. While the band played, a panel van (what else?) driven by a Phillip Island surf shop owner Laurie Thompson became “bogged” half way up the skate ramp. 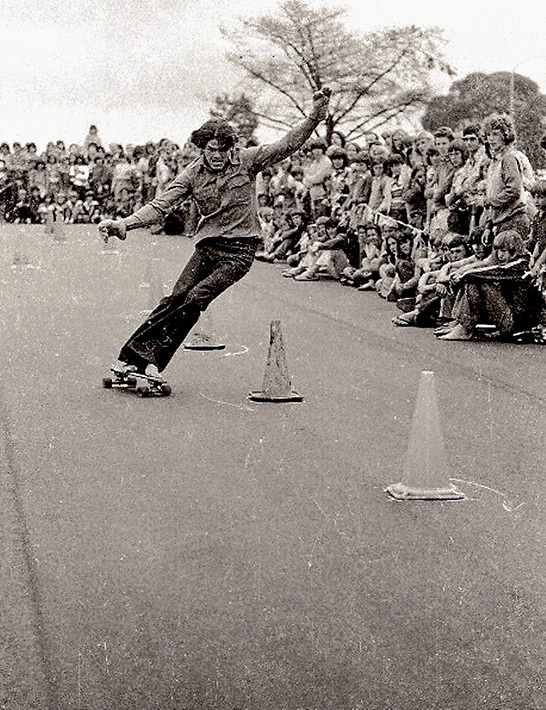 Almost without blinking, the skaters adjusted their downhill trajectories to swerve around the new obstacle and the band, led by Glenn Shorrock, didn’t miss a beat. Thompson had to wait until the big top was taken down the following day before a crane could be brought in to remove his van. Breakway (now online at breakway.com.au) was published by keen surfer Ted Bainbridge (Peninsula Surf Centre) and journalists Tony Murrell and Keith Platt. 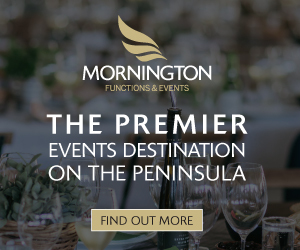 It was printed at Standard Newspapers, Cheltenham and run out of the Trigger Bros shop at Chelsea and then the first of Peninsula Surf Centre’s retail outlets in Nepean Highway, Frankston. The photo darkroom was above the adjoining butcher’s shop. The beginning of the magazine coincided with the emergence of surfing from being an undercurrent culture to the mainstream. Advertising agencies were recommending it be used in ads for all sorts of products that had nothing to do with surfing and surfers were realising there was money to be made from their sport. Professionalism was just around the corner and the future heavyweights of the surf industry – Rip Curl, Quiksilver, Balin, Billabong, Ocean & Earth, Piping Hot – were early in the industry line-up. Their owners, all surfers, had almost stumbled into the business looking for an occupation that would allow them to go surfing whenever the waves were breaking. Like a snowball gathering speed and size rolling down a hill, surfing became commercial. The 1970s was a period of transformation and Breakway inadvertently caught the wave that commercialised a lifestyle, from December 1973 until January 1978. In all, there were 47 issues. Having music and movie sections in Breakway was almost a non-brainer. Surfers were party animals and taped music was a necessity to background those long drives up and down the coast. As well as reviewing records (12 inch vinyl LPs) the magazine ran interviews, profiles and articles about such artists as Mike Oldfield and his breakout release, Tubular Bells (Virgin Records); Lou Reed’s Walk on the Wild Side (would it get radio air time? ); Skyhooks’ Living in the ‘70s; Eric Clapton; Bob Dylan; Mark Holden (when he was a relatively unknown singer and decades before he was an X Factor judge); Status Quo; the Doobie Brothers; Little River Band; Brian Ferry; and Richard Clapton (in Melbourne for concerts and would go back to Sydney by train because he didn’t like flying). 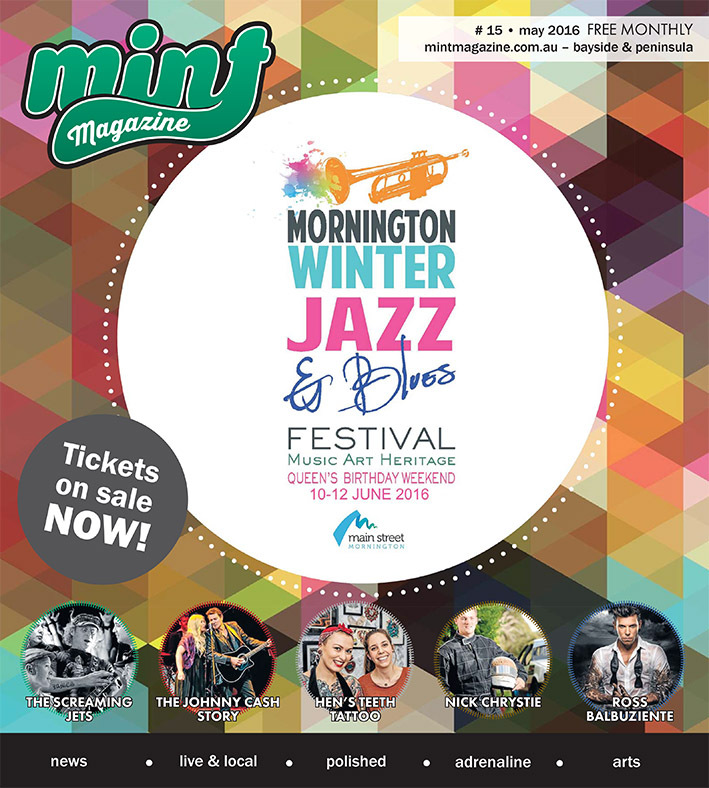 In July of the same year Mark Holden was being introduced to Australia via a $15,000 EMI promotion tour which included Kerrie Bidell and Ross Ryan. Holden, who said he’d been a surfer at 16, told Breakway his next album would be “more mature”. His song Mike’s by the Sea was about his surfing days. In August newspaper journalist Tom Wiles attended an all-in TV, radio and press interview with a spirited and sometimes testy Lou Reed. “Don’t tangle with me, you’ll get eaten,” Reed fire back at one stage. In March 1976 Dale Peterson tracked down Patrick Simmons, who’d replaced Tom Johnstone for the Doobie Brothers’ Australian tour. He felt the band was better received in Oz and Japan than the United Kingdom and listed the Reneee Gayer Band as “probably tops [of Australian bands] as far as I’m concerned”, quickly adding praise for Pantha, the Doobie’s support. Record store owner and radio DJ Rod Stone wrote a monthly Soundwaves column, following the ins and outs of the music industry, including a piece in April 1976 about the legality of tape recording records. In January 1975 he reminded readers of his earlier warning that album prices were about to hit $6.95. A year earlier he was writing about the fortunes being made by Mike Oldfield on the back of Tubular Bells, comparing Gary Glitter to something out of The Exorcist and how Cat Stevens came up with the name for his latest album, Buddha and the Chocolate Box. In December 1977 Breakway noted the deaths in a plane crash of three members of Lynyrd Skynyrd – singer Ronnie Van Zant, guitarist Steve Gaines and his sister, back-up singer Cassie Gaines. The group’s Sweet Home Alabama put them at odds (some say wrongfully) with Neil Young fans. The photo accompanying the article was taken by Keith Platt in February of that year as Lynyrd Synyrd performed in an old picture theatre in Glasgow, Scotland. Platt had stumbled on the band when he heard, and watched, a morning sound check (before being evicted). Richard Clapton was interviewed by Breakway in November 1977 at Melbourne’s Southern Cross Hotel. It was 11am and he sat drinking his first coffee for the day surrounded by the previous night’s empty bottles. Recently back from Europe, Clapton was promoting Goodbye Tiger. “I’ve never been super ambitious, I’ve been sorta slack,” he said. Going slow was also one of his reasons for preferring the train to flying. Just eight months after scoring the Little River Band for a song (pun intended) at Surfworld, Breakway’s July 1976 edition told of the band’s two gold albums and success in Australia and overseas. An interview with Deep Purple’s David Coverdale in March 1975 revealed the band was paid $250,000 to perform at that year’s Sunbury Pop Festival. Coverdale left the band one year later just before it disbanded, going on to form the successful Whitesnake. Digital reproductions of the original issues of Breakway are available at breakway.com.au. The website continues to grow with the addition of more contemporary articles and features and has links to Facebook and Instagram.